UPDATE:There's no better time to perfect your pie recipe than on National Pie Day. Luckily for you, that momentous holiday happens to be today (!!!) and we've got the perfect dish. to celebrate! This article was originally published on December 13, 2012. As fashion enthusiasts, we tend to borrow inspiration from our families. After all, the hand-me-downs only get better overtime. Likewise, chefs turn to (who else?) their mamas to get in on the homemade goodness. 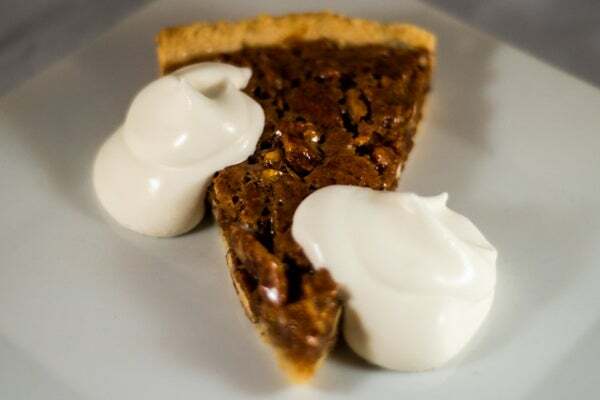 And now, we've tapped James London, executive chef at the delicious Japanese/Southern-fusion, downtown hotspot Co-Op Food And Drink (at the Hotel Rivington) for his mother's OG Pecan Pie recipe. It may not be what the trainer ordered, but it certainly is what the proverbial doctor did. Plus, the only way to perfect the dessert before the holidays is some baking and taste-testing trial and error, right? In a large mixing bowl, combine corn syrup, sugar, flour, salt, cinnamon, vanilla, eggs, pecans and melted butter. Pour into unbaked pie crust. Bake on the low rack of a preheated 300 degree oven for 1 hour, or until knife inserted near center comes out clean. Bring to room temperature and top with lightly whipped cream, sweetened with a little maple syrup or sugar. Co-Op Food And Drink , 107 Rivington Street (at Allen Street); 212-796-8040.